Population dynamics & global change - Kristen E. Dybala, Ph.D.
Understanding the population-level effects of climate change requires examining direct and indirect effects of weather on multiple life stages and demographic processes. 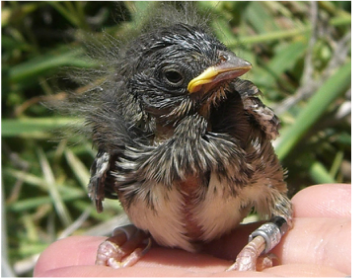 In my dissertation research, I found that adult and juvenile Song Sparrows (Melospiza melodia) were affected by different weather factors, resulting in differences in their projected responses to climate change. By further examining the influence of parental care on juvenile survival, I found that these weather factors had a strong effect on the survival of independent juveniles but no effect on dependent juveniles. Independent juveniles contributed more to variation in juvenile survival, and the survival of independent juveniles may be a major driver of population responses to environmental change.